It can be a bit difficult to describe what Comms Unplugged is all about. Yes, we can talk about the epic line-up of speakers and workshop leads providing a rich diet of professional development. Yes, we can wax lyrical about mindfulness in the woods, yoga under canvas and the relief of having no technical distractions. And yes, we can definitely sing the praises of wood-fired pizza around the campfire and the odd glass of locally distilled gin! But what we can’t fully convey is how it feels. 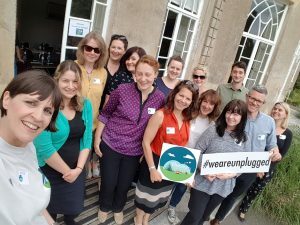 That’s one of the reasons we teamed up with the Government Communications Service in the south west to run a Comms Unplugged taster session. We wanted to actually show people how the combination of fresh air, beautiful surroundings, no tech and like-minded peers can be a real eye-opener. Our 14 delegates gathered at Upton Country Park in Poole this week not really knowing quite what to expect. They came from a wide range of organisations including the RNLI, the Cabinet Office, the Land Registry, the MOD, HMRC and the Office for Students and most didn’t know each other. Now, we get that it can be hard to pitch up in a room (or a field, for that matter) and drum up conversations with people you’ve never met before. But it’s actually way easier to do that when you’re strolling through the woods, chatting about the things in life that you’re passionate about. And it feels friendlier to talk about work stuff over a slice of home-made cake and a brew, doesn’t it? 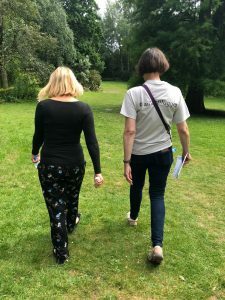 Our mini-unpluggers all entered into the spirit of the afternoon, chatting non-stop as we wandered around the country park, slowly letting go of our stresses and strains and breathing in the fresh air. 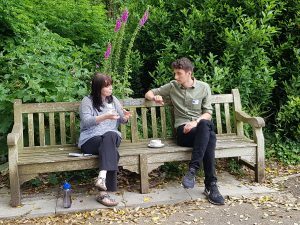 By the time we asked them to discuss a knotty issue they needed help with, they happily paired up, found a quiet bench outside and supported each other to find solutions and new ideas. That’s the power of being unplugged and, instead, connecting with your environment and your colleagues. We had a great afternoon and were proud to share what we’ve learned and our passion for doing things differently. We hope that some of this week’s new friends will be joining us in the field in September. Actually we want lots more busy comms folk to take some time to enjoy a really different experience – are you with us? 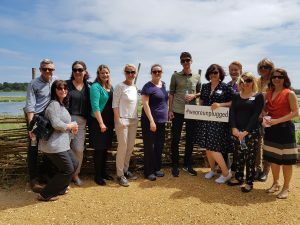 Comms Unplugged 2018 takes place at Burnbake campsite near Corfe Castle in Dorset from 13-15 September. Tickets start at £70 for a day ticket. The full two-night ticket is £150 and includes all speakers, activities, catering and pitch fees.